Connected to Kalye Escolta is another place which was a prominent commercial area in the early 20th Century. This place is now known as Lacson Plaza in honor of the Arsenio Lacson, who was the first elected mayor of Manila. Prior to 1952, mayors of Manila were appointed by the national government. This was changed to allow Manileños to vote the leaders that they wanted. Lacson Plaza as viewed from LRT-Carriedo Station. Manileños wanted Arsenio Lacson so they chose him over the Malacañang-backed incumbent Mayor Manuel de la Fuente. Some say that Lacson is the best mayor that Manila ever had. He is known in removing around 600 corrupt or incompetent employees and policemen as part of reducing graft and corruption. Mayor Lacson is so popular that, aside from this plaza, a street beside University of Santo Tomas and the underpass beside Quiapo Church bear his name. Arsenio Lacson...and Derek Ramsey's ex-girlfriend is hogging the limelight. The shades made me thought that this is a statue of General Douglas MacArthur. This plaza is connected to MacArthur Bridge, which somehow validated that I was correct. Now I know that I was wrong. Located around this statue are big buildings, which echo the commercial significance of the area in the past. Señor Enrique wrote in his blog that Plaza Lacson is the place where Adamson University was established in 1932 and was originally called as the Adamson School of Industrial Chemistry. The school was re-opened along San Marcelino Street in Ermita after the Second World War and then was given to the Vincentian Fathers, which made the university as a Catholic institution. The FEATI University is another academic institution in the area. This university was popular in producing engineers and technical experts. Its building is located behind the now-abandoned building of Plaza Fair. Lacson Plaza with LRT-Carriedo Station at the background. The brisk business around Lacson Plaza in the early 20th Century was replaced by commercial inactivity. Plaza Fair has shut down. Isetann only operates the ground floor as department store and the basement as grocery. The original store of Henry Sy's Shoe Mart (SM) along Carriedo Street became an obscure SM outlet. PhilTrust Bank located behind Arsenio Lacson's statue is one of the two banks still operating around Lacson Plaza. This building is the Roman Santos building, which was the original headquarters of the now defunct Prudential Bank. The building is now occupied by the Bank of the Philippines Islands (BPI). Another Prudential Bank structure, located along España Boulevard, was now also occupied by BPI. This means that BPI already acquired Prudential Bank. I always admire the Greco-Roman facade of this building whenever I pass by Lacson Plaza. The plaza already exists since the Spanish Colonial Era. Its former name was Plaza Goiti, in honor of the Spanish conquistador Martin de Goiti who captured Manila after defeating the allied forces of Rajah Sulaiman, Rajah Matanda and Rajah Lakandula. De Goiti was an able Spanish commander since he was able to defeat the numerically superior forces of the tribal leaders with just 300 Spanish soldiers. The Spanish commander founded other settlements in other parts of Luzon. The king of Spain bestowed Laguna as his encomienda as the reward for his exploits. This tidbit is now the basis for the founding date of the province of La Laguna. De Goiti met his death in the hands of Limahong and his 3,000 Chinese pirates. The pirates sacked Manila and captured many villages outside of Fuerza de Santiago (Fort Santiago). The Spaniards, coming from Cebu and Vigan, avenged De Goiti by defeating the pirates at Pangasinan. The name Plaza Goiti means that the area of Lacson Plaza is already an important place even during the Spanish Colonial Era. I think that this plaza is a link between the Spanish settlement within Intramuros and the Chinese businesses located in Binondo Chinatown. 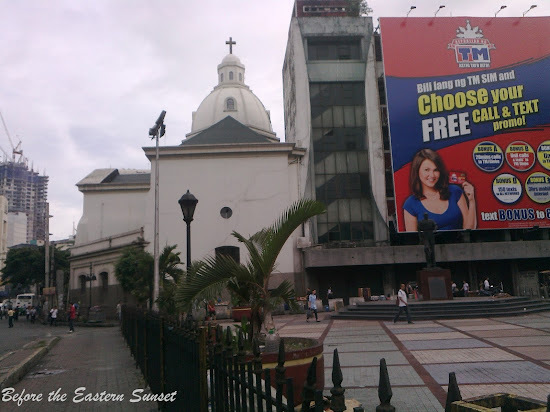 Lacson Plaza with Santa Cruz Church at the background. Lacson Plaza is another place in Manila that is rich in history. Sadly, just like Calle Escolta, this place became “dead” business-wise because it was obscured by the business districts of Makati and Taguig. This place is also “dead”, like many parts of Manila, due to neglect. Santa Cruz Church is the only structure that, I think, is very alive in this area. Many people, especially the employees of nearby establishments, flock to this church in the morning and late afternoon (before and after the work hours). Plaza Goiti of the past was changed to become Lacson Plaza of today. What will this place look like 50 years or so in the future? I hope that this place change for the better. 1. Wish You were Here blog of Señor Enrique. 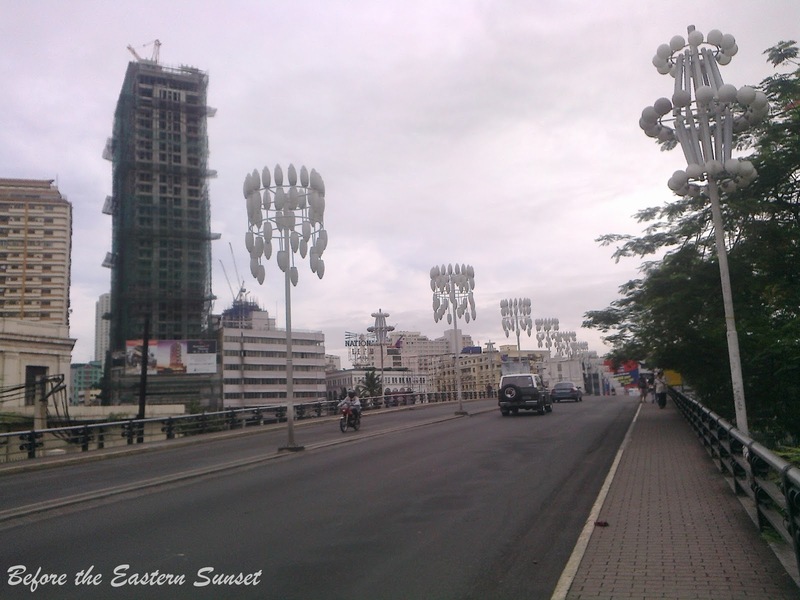 Have you been to Lacson Plaza? What was your experience? Please let us know by leaving a comment in the combox below.